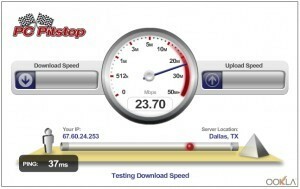 Is your internet speed slower than what you expected from your Internet Service Provider? Chances are you reached this article because you’re concerned whether or not your Internet connection is really as fast as your service provider said it would be. There’s a lot of controversy going around about this, usually in the form of people who believe they may have been cheated by the company. While this might be the case, it never hurts to examine the most common causes of slower-than-advertised Internet speeds and determine whether one of these is happening to you so that you can determine how to remedy the situation. More than likely you’re probably using a router right now that you’ve possessed for a very long time. As routers age, they no longer correspond to the speeds that your service provider gives you. When the processor inside the router starts overheating, speeds get drastically slower. You’ll know this is happening to you if you get fast speeds after turning the router off for a few hours. But sometimes routers simply start failing without any other symptoms except a consistent slow speed. Call your ISP for a new router if they provided you with the one you have. If you can find a spare router, test your speed on it. Perhaps it’s time you considered getting new network hardware. I, for one, use my computer as the primary router in my household. This is not possible in cases in which you have a DSL connection. It’s only available for people who use fiber-optic high-speed connections. Your Internet service provider (ISP) has several routers set up along different neighborhoods. Your local router is shared with all of your neighbors. If too many of you are trying to download at high speeds all at the same time, you may experience slight cuts to your line’s performance. This is natural, and simply demonstrates that your ISP doesn’t have enough local routers to competently route all of your signals. In this case, you either gather up your neighbors and get them to join you in petitioning the company, or you simply switch over to an ISP that fewer people in your neighborhood are using. However, take note that problems probably aren’t just local. Thanks for the info, I will go to the grc site now. I would advise everyone that if you have an old router, go out and spend a little bit of money for a good one. A top-of-the-line router does wonders. After that I would go out to Gibson research center (grc.com) and download his DNS benchmark software. It will pick out the fastest name servers available to you and after a few testings you can change your name servers to be much faster than the ones that your ISP gives you. I run this and check mine once a week. It gives you additional speed.